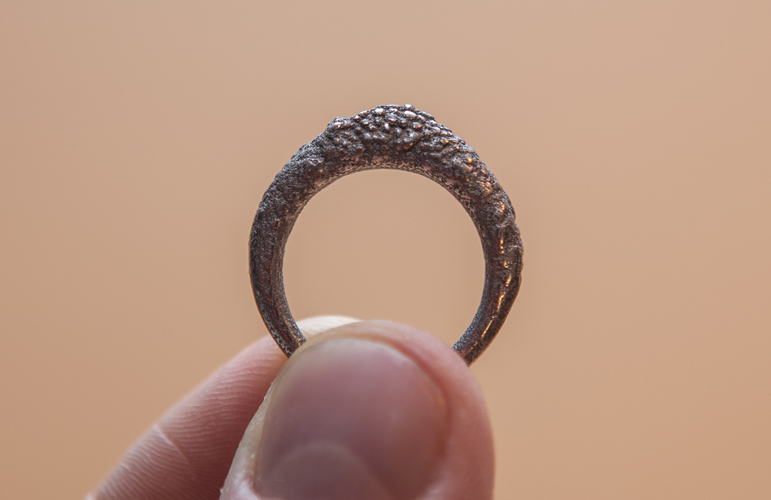 ‘Infected’ is a series of 3-D printed jewelry, based on an experiment with infected fungi. It is a self-initiated 2010 project by Maurizio Montalti, as part of Officina Copuscoli, a multidisciplinary creative consulting studio. This project is inspired by bacteria that grows when the human touch infects. So, varying kinds of bacteria started to grow in a circular profile, and differing shapes appeared, with fascinating textures, “proposing the origin of a narrative around the fundamental role that such micro-organisms play in our earthly existence. The result of the organism’s colonization gave life to a series of wearable ornaments, aiming at a reflection over our bodies’ identity and about the consciousness related to the variety of life-forms which make possible for our body to come into being (http://www.corpuscoli.com/projects/infected/).” This experiment in bacteria-inspired jewelry combines the technological mode of 3-D printing in addition to the natural element of bacteria that is present in our everyday world, that we wear on our bodies, but is not immediately visible. 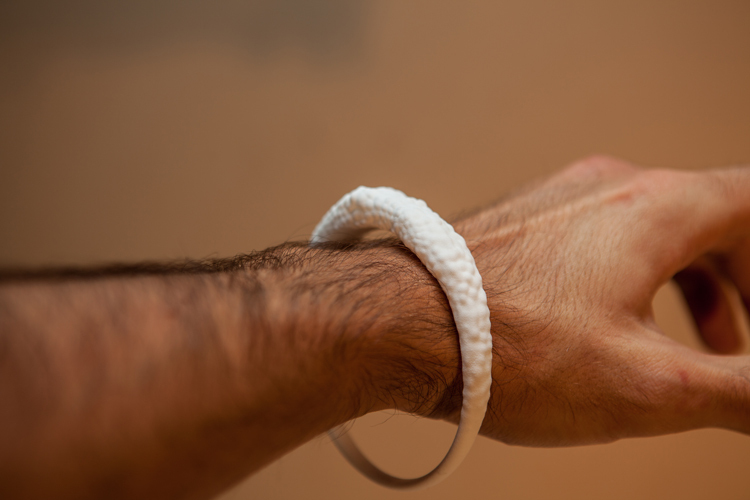 This project allows one to physically wear a representation of the unseen infection that humans can inflict. Ergo Sum is an extremely fascinating art work incorporating biotechnology. It was created by Charlotte Jervis, an artist-in-residence at the Netherlands Proteomics Centre in 2013. It was originally on display as part of the Netherlands Genomics Initiative’s Designers and Artists 4 Genomics Award ( DA4GA). For this project, Charlotte sought to create a ‘second self’ through her own donated tissues that were transformed into stem cells and eventually ‘active brain,’ ‘beating heart,’ and ‘flowing blood’ vessels. She spent months working to bring her ‘partial doppelganger’ to life. In addition to the main scientific endeavor, she also created an incubator for displaying her cell samples. Essentially, Charlotte used “her own body to demystify the processes and challenge the prejudices and misunderstandings that surround stem cell technology” (http://we-make-money-not-art.com/ergo_sum_the_creation_of_a_sec/). Ergo Sum began as a performance at WAAG society in Amsterdam. During the performance, Charlotte donated parts of her body to stem cell research. Blood, skin, and urine samples were taken and sent to the stem cell research lab at the Leiden University Medical Centre Core Facility, directed by Professor Dr. Christine Mummery. After this, scientists transformed the samples into induced pluripotent stem cells, which were then programmed to grow into cells with different functions, such as heart, brain, and vascular cells. The entire process was based on Nobel Prize winners John Gurdon and Shinya Yamanaka’s discovery that adult, specialised cells can be reprogrammed and developed back into stem cells similar to embryos, which could then become almost any cell type and then grow into any tissue. Charlotte’s stem cells were copied, and are now immortal, as the cells can be stored for an unlimited period of time. The body parts that were created through this process (a brain, heart, and blood cells) were kept in an incubator made specifically for the viewers at the museum. In a sense, “Ergo Sum is a biological self portrait. a second self; biologically and genetically ‘Charlotte’ although also ‘alien’ to her – as these cells have never actually been inside her body.” The whole process was essentially ‘cellular time travel’. Last year, media artist Dmitry Morozov, from Moscow, created a machine called “digioxide” that finds pollution in the air, and transforms it into glitch art. The machine is portable, and connected by Bluetooth. It is made out of sensors that “measure dust and various gases like CO (carbon monoxide), CO2 (carbon dioxide), HCHO (formaldehyde), and CH4 (methane)” (http://www.wired.com/2014/07/a-clever-device-that-turns-polluted-air-into-art/ by Liz Stinson, 07/23/14). The sensors transfer the air data into volts, and an Arduino is used to translate the volts into the glitched art made of colorful shapes. The machine prints out the glitched art as the pollution is measured. Morozov has traveled around various areas to test the machine, and learned that pollution was the worst during rush hour on the street in Moscow. Thus, the brighter the image, the dirtier the air. The presence of green in the images indicates clean air, which was mostly found in parks. He is really mainly interested in the most polluted areas, however. And says, “The more pollution I get, the more beautiful the images are…It’s a little bit ironic.” But the main cause of the project was to raise public awareness of environmental pollution through artistic means. This connects to technology and nature because Morozov utilized technology to measure natural gasses in the natural environment and then created art through his process. Brian Goggin is a multidisciplinary artist who creates sculpture, public art work, and installations in galleries and museums. He places his work in non-traditional locations and uses non-traditional methods. (http://www.metaphorm.org/bio/) He mostly connects natural aspects of life with the technological or everyday objects we see in our lives. The lights glow at different rates and colors. 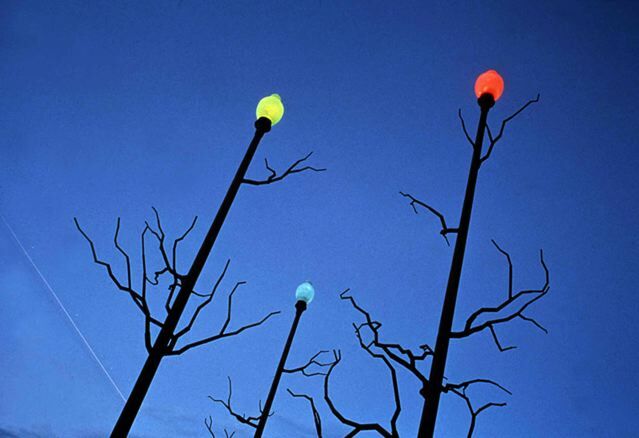 There is a history to the area that he lampposts are placed in, which add to the artistic story of the piece. According to the website, the area before was an untouched forest, which was later cut into to create trade routes, and then the area was developed into a military roadway that allowed for access for farming the land. After this, residential housing appeared, but now, coincidentally, there is nothing there. As the site states, “Beneath the surface of the earth lies a seed pod for future archaeologists to harvest a field of understanding into 20th century suburban residential living. Out of this soul emerges iconic representations of the past.” Thus, those who lived on the soil in the past, were not a threat to the land, but rather, a “source of accidental beauty, a garden of unexpected and partly un-designed delights. A juxtaposition of the mineral and vegetable worlds, this artwork alludes to a potential fusion of technology.” This artwork allows for the joining of the past, present, and the technology of today to create a work of natural history. 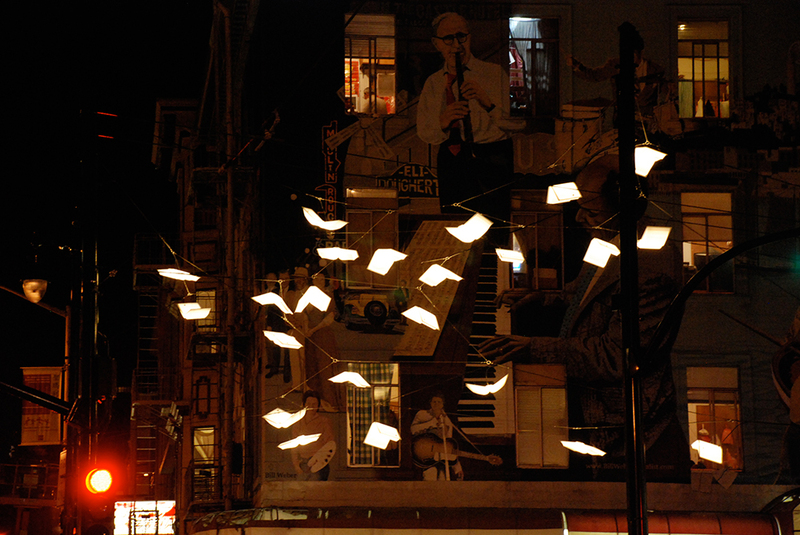 Language of the Birds, Brian Goggin with Dorka Keehn, 2006-2008, site-specific sculptural installation for the public plaza on the corner of Broadway, Grant and Columbus Streets, San Francisco) source: http://www.metaphorm.org/portfolio/language-of-the-birds/. This piece features 23 sculpted and illuminated (by LEDs) books fabricated in frosted white translucent polycarbonate that appear to be flying through the air on stainless steel aircraft cables from the plaza. When one walks underneath the books, pedestrians notice words that “appear to have fallen from the pages.” The words are in English, Italian, and Chinese, and were selected from the “neighborhood’s rich literary history”. This sculpture is an example of Goggin’s that re-imagines and brings life to an ordinary object, while also combining technology along with the natural element of birds in flight. Unfortunately, I could not attend Nuit Blanche this year because I got sick on Friday. However, I did get to see many engaging images and accounts of the event. One of the main installations that kept popping up on social media was “bit.fall” by Julius Popp, first installed in 2001, composed of stainless steel, custom electronics, computer, custom software, and water. It has been exhibited all around the world, and was most recently at the all-night art festival in Paris, Nuit Blanche. It is essentially a fountain of water falling in the formation of certain letters. Looking closer, it appears to be a rainy downfall of data. According to The Power of Art, by Richard and Susan Lewis, to better explain it, “Brightly lit words appear and then dissolve; they hang in the air for just a moment before they drop into the pool below. The effect is created by theatrical lighting and a series of water valves controlled by a computer. The words are chosen by a live feed of popular search terms on Google News.” Popp, a German artist, explains this work as a “metaphor for the incessant flood of information we are exposed to.” Once this installation is installed, viewers can run through the rain, and let the data downpour drench them, metaphorically getting doused with the immense amount of information we have at our fingertips online. This is a perfect example of merging technology and nature, as the natural element of water allows for the metaphor of this constant stream of data to come alive. Humans put these fiber optic cables into the ocean, which is a clear invasion of the underwater species’ habitats, and are confusing sharks. Sharks are interested in the fiber optic cables, and thus chew on them, represented in the 3-D printed shark skeletons which have brightly-illuminated fiber optic cables in their mouths, so it appears they are biting down on them. It is not completely clear why the sharks are biting on the cables, but “one theory is that the magnetic field around the fiber optic cables is stimulating the receptors in sharks’ mouths and luring them to perceive the cables as prey,” according to Samanci. A boat on the water in the exhibition space of Acquaalta. A few weeks ago, I was lucky enough to visit an amazing multi-sensory experience titled Acquaalta in its final weekend at Palais de Tokyo. The installation was created by Celeste Boursier-Mougenot, who represented France at the Venice Biennale (which started on the 9th of May and ended on the 22nd of November). I went with my friend on the last weekend it was being displayed, and I am so happy I made it to see it. I did not know much about Palais de Tokyo before entering the building, but once inside, I knew it would be an otherworldly experience. As we were in line to get our tickets, I noticed a black pool of water directly in front of us, but it was seemingly very expansive. Right away, I knew we were looking at the “boat pool” as we had called it before actually learning the real title, Acquaalta. And then we got in line for the very intriguing exhibition. It turns out, we had to steer a boat around the exhibition space made of water with two other completely random museum-goers. So, we stepped into our wooden vessel, with our newly acquainted boat-mates in the front. My friend and I sat in the second row, and we descended into the darkness of the exhibition. The main part of the exhibition features museum-goers using large wooden rods to steer the boats around a black environment with screens projecting different animation-like images. According to the Palais de Tokyo exhibition section of the museum website (http://www.palaisdetokyo.com/en/exhibition/celeste-boursier-mougenot), acqua alta is the name of the annual flood of the Venetian lagoon. Thus, Bousier-Mougenot brought this flood to Palais de Tokyo, along with filmed images that are “captured and transmitted live as silhouettes” (http://journalduluxe.fr/acquaalta-palais-de-tokyo/). There is also background sound playing as the rowers make their way through the exhibition. It sounded like eerie, echoing banging. The ambiance in the water was really quite unnerving, especially because it was so dark. I enjoyed this exhibition because it merged the processes of technology and a weather phenomenon that is part of nature. There were large screens projecting the images of the real-time rowers in the water. This allowed for us to reflect (metaphorically and actually) on the idea of the flood and the natural effects of water in a normally un-affected space. We watched ourselves and truly imagined this “imaginary journey, a voyage through [our] own psyche,” according to the Palais de Tokyo website summary. Overall, this method of merging technology and the natural was really intriguing to me in a space that is normally unaffected by the presence of water.